We are all aware that numbering PDF files manually can be a very monotonous and time consuming task. Also there is a scope of making grave mistakes if they are in bulk amount. PDF Bate Numberer will prove to be very useful if you want to avoid numbering PDF files manually. This software seamlessly disguises the efforts put in arranging bulk PDF files. In ancient times Bates Numbering was done by manual stamps in order to organize and manage papers and documents used by legal authorities, educational institutions and other similar organizations. But today it’s the era of technology and in this era PDF is highly popular among the users. If you are a person who can easily get confused while numbering your PDF files the software will prove to be a great asset for you. The software is designed keeping in mind the need of Bates numbering for official documents. For this purpose they have given various options to you so that you have the liberty of numbering your files in your own way. This software enables the users to choose from 2 options for generating Bates number-Generate Bates Number or Generate Bates Number for File Series. You can also add prefix and suffix along with the Bates number. To avoid confusion, the software gives the user the option to select the number of digits one wants in Bates number. The software removes the encryption on the PDF Files and then Bates numbering is done. If you want to add some additional text like your company name or some logo, the software enables you to do so. You can also decide the positioning of this additional text in your PDF Files from bottom left, bottom right and top left or top right options. You can decide the position of Bates number the way you want them to appear on your PDF files and pages. The other options that the software provides are that you can ‘Continue the number series for all PDF files’, ‘Maintain same number per file and stamp’ and the ‘Current date on the top right’ of your page. Before stamping the software will give you a preview of how your files will look after getting stamped. This feature enables you to view your file and make any changes you desire. After stamping a complete status report will be generated enlisting the color, font, selected files, etc will be shown to you. Also you can export the status report to your desired destination. You can download the free version of the software to run a check on your PDF files. 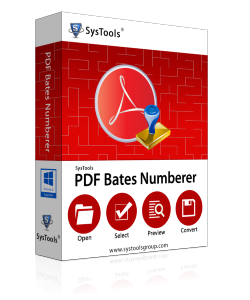 Although with the help of the free version one can execute every step of page numbering, including Bates number generation for the PDF. As nothing in this world comes free the trial version also has one disadvantage that it will watermark your PDF files with company name after stamping. So if you are planning to download a free version to Stamp your official PDF files, purchasing the software will be a requirement after satisfaction. This software company provides 24/7 technical support. Also company’s email support is appreciable. All the queries are answered in a simple and understandable way. You can also see articles, FAQs and related materials on their knowledge base. We submitted a question on their website and they answered it in a few hours. They also provide a worldwide toll free number and telephone support in USA. The PDF Bate Numberer insert bates numbers in pdf files in bulk without wasting your precious time and that too with an ease. You can even add suffix, prefix to the Bates as per your convenience. As such, I cannot find any bad point about the product. The product works seamlessly and the options and capabilities offered are quite impressive. Sorting your PDF Files manually can be a very stressful task. PDF Bates Numberer makes it easier to manage your PDF files in just one go. This software is a pretty solid entry in this market and comes at an affordable price. The trial version is free and the complete version comes at an affordable price of $129.